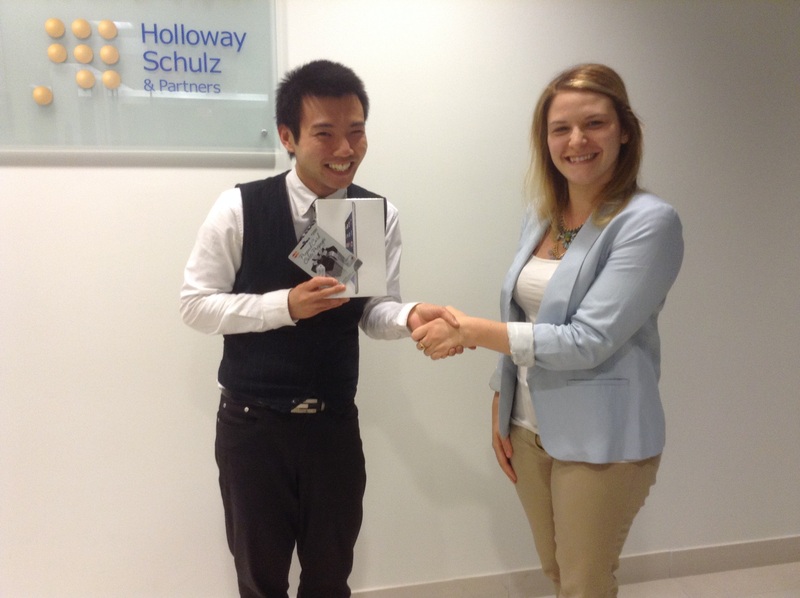 New Year, New You 2014 Internship Winner Blog: Introducing Johnny Wu! Although it is officially a couple of weeks into my internship here at Adecco Canada, I still remember that moment when I checked my email on April 2, 2014. Oh my God?! I won?! I thought to myself. I was filled with excitement, anxiety and shocked that I won. I still remember that one Wednesday night back in March when I was drawing up concepts, filming and experiencing multiple software crashes while editing. But eventually it was all finally done…at 3AM. Making videos is a passion of mine and when I saw the Adecco Contest I was determined to submit an entry, but never did I imagine I would be the grand prize winner. I truly didn’t know what to expect from this internship, but I had a good feeling that it would involve me doing interesting work. Be sure to check out a snippet of my video submission below! Johnny Wu accepts his MasterCard gift card for new business attire and his new tablet from Marketing Manager, Jessica Rowen, as winner of Adecco Canada’s 2014 New Year, New You contest. Johnny also won a paid summer internship at Adecco Canada’s corporate headquarters in downtown Toronto. After being introduced to every department, attending three informational meetings and one training session, and enjoying a welcome lunch with HR and marketing, it was 3PM already and I needed to submit a summary and timeline for an upcoming contest. Day 1 was an action packed day, and every day since has been a blast. My Very First Project & Highlight! I have been assigned to complete three training modules for Ken Graham, Director of Training and Professional Services. The training was on how to use LinkedIn, and I was confident in my knowledge until Ken asked me “Do you know Boolean logic?” I replied with a honest “no” and Ken gave me two pages on Boolean logic. He wanted me to create a PowerPoint deck for training purposes, but what I didn’t know then was that this deck was going to be seen by roughly 300 Adecco employees across Canada. Never have I done any work in my professional career that would be seen by so many people. I felt scared, short of breath and genuinely honoured to be given an opportunity like this. I can’t wait to see my work being used in the field and share that experience in my next blog post! So far this internship has definitely given me the opportunity to dive into projects and challenges head first. It’s an incredible feeling having so much freedom to do my work and how creative I can be with my current project. I was given a blank canvas and now I just hope I won’t disappoint Ken with my finished product. Speaking of colleagues, everyone at the office is a superstar (honestly!). I’ve worked in different offices before and I have never found a group as dynamic as this. Everyone is committed to and passionate about their work, and they all care about one another’s well-being. Seriously: Adecco Canada was recently named one of the Top 50 Best Workplaces by the Great Place to Work® Institute. I can definitely see why that is. Want to know what’s happening at my internship with Adecco Canada? Be sure to check out Adecco in the Know and Adecco Canada’s Facebook and Twitter pages every couple of weeks for an update!